Case of the Week: Take a deep breath! A middle-aged woman presents with a 6-8 week history of progressive shortness of breath to the point where she becomes dyspneic with activities such as dressing herself, brushing her teeth and buttoning a shirt. Past medical history is unremarkable and currently on no medications. No recent travel history. No known exposure to birds or other farm animals. She was previously treated with a 7-day course of antibiotics for a presumed pneumonia several weeks prior. There has been no improvement with the antibiotics. She denies any fever associated with this presentation. She has a non-productive cough during this time. No congestive heart failure symptoms apart from the exertional shortness of breath. All investigations including bloodwork and echocardiogram were normal. Chest-X Ray and CT scan of the thorax is shown below. Answer will be revealed next week! 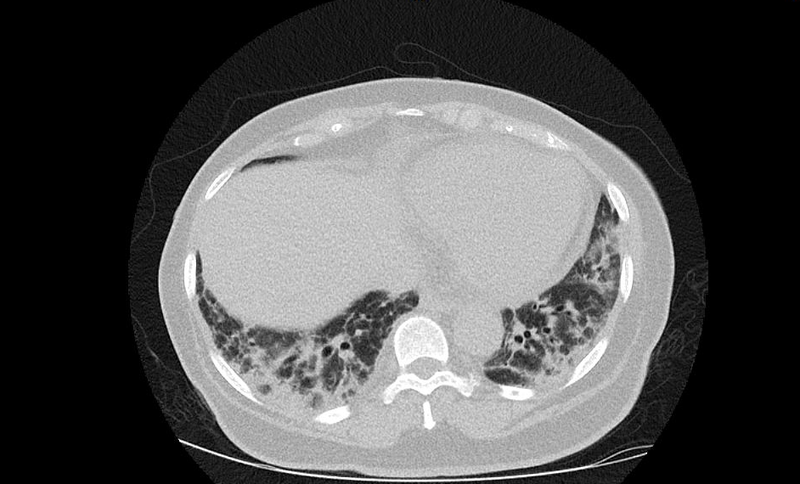 This is a case of cryptogenic organizing pneumonia as 83% of you correctly selected on the poll. Cryptogenic Organizing Pneumonia (COP) is clinicopathologic syndrome of unknown etiology whereby patients usually in the fifth and sixth decades are afflicted with cough, fever, dyspnea and chest-x ray features showing opacities suggestive of pneumonia. COP does not respond to antibiotics and patients usually respond quite well to a course of corticosteroid therapy. In the case above this patient had no known exposures to birds which made a diagnosis of psittacosis unlikely. Additionally, there had been no prior history of significant of immunosuppression to suggest PCP infection.